Starting antiretroviral therapy (ART) very soon after infection may limit the size of the HIV 'reservoir' and delay viral rebound after treatment interruption, according to several presentations at the recent Conference on Retroviruses and Opportunistic Infections (CROI 2015) in Seattle, USA. Other research showed that various biomarkers may predict who will experience HIV rebound after stopping ART. As part of its lifecycle, HIV integrates its genetic material into the chromosomes of host cells and uses the cell's machinery to produce new virus. Soon after infection, HIV establishes a reservoir of latent genetic material, known as proviral DNA, in inactive or resting T-cells. While ART can effectively control viral replication long-term, if the drugs are stopped the virus soon comes back, presenting a major barrier to viral eradication. Helen Payne of University College London presented findings from the CHER (Children with HIV Early Antiretroviral Therapy) trial, in which infants who had acquired HIV via mother-to-child transmission were randomly assigned to start immediate ART lasting for 40 or 96 weeks or to delay treatment until they showed signs of disease progression. CHER enrolled more than 400 infants with HIV in South Africa who were younger than 12 weeks of age and had a CD4 T-cell percentage >25% at study entry. As previously reported, the study found that early ART reduced mortality by 76% compared to deferred treatment. The current sub-study looked at 247 children who had been on ART for a minimum of 24 weeks with suppressed plasma viral load. The children in the immediate ART group spent a median of 96 weeks on ART versus 81 weeks for children in the deferred group who eventually started treatment. Peripheral blood mononuclear cell (PBMC) samples were collected every 12 weeks with a maximum follow-up period of nearly five years. HIV DNA was measured using a test with a limit of detection of 1 copy per 100,000 PBMCs. Children who started early ART and were treated for 96 weeks had a significantly smaller reservoir, or lower level of proviral DNA in their immune cells, than children in the deferred treatment group (median 27 vs 100 copies per 100,000 PBMCs). Not surprisingly, proviral DNA levels rose when the children interrupted treatment. By week 248, HIV DNA levels were similar among early-treated children who stopped at 40 weeks, those who stopped at 96 weeks and those who delayed treatment, indicating that the benefit of early ART can be lost after treatment interruption. Reduced viral reservoir size and the probability of achieving an undetectable viral reservoir – which does not mean HIV was eradicated, only that it could not be found using current tests – were strongly associated with younger age at ART initiation, more cumulative time on ART and longer duration of continuous viral suppression. In addition, having a higher level of cytomegalovirus (CMV) DNA at baseline was significantly associated with a larger HIV reservoir. However, HIV serostatus (testing HIV antibody positive or negative) was not a significant predictor of viral reservoir size. Interestingly, another study by researchers from the University of California at San Diego found that detectable CMV DNA in PBMCs was also associated with higher HIV DNA levels in adults who started ART during early HIV infection. These findings suggest that "CMV replication may help maintain the stability of the HIV DNA reservoir," the investigators concluded. The CHER researchers presented more detailed profiles of five children who had undetectable proviral DNA at least once during follow-up. Four of them had started early ART (at week 6-7) and interrupted treatment at week 96, while the fifth was in the deferred group (starting at week 14). Among the four who started early ART, two were HIV-positive and two were HIV-negative. Eventually all children who interrupted ART experienced HIV rebound. "Early initiation of ART and sustained virological suppression are key to reservoir reduction," the researchers concluded. "These results may provide valuable insight for potential future therapeutic interventions for reservoir reduction such as vaccination, activation and clearance, and treatment of co-infections at ART initiation." Of note, while the infants in CHER started treatment early, they would not be considered as starting 'very early' as those who reached undetectable HIV DNA started ART at 6-7 weeks of age. In contrast, the 'Mississippi baby', who was widely thought to be cured before experiencing HIV rebound after being off ART for more than two years, started combination ART at around 30 hours after birth. In a related poster, Priyanka Uprety from Johns Hopkins and members of the team that studied the Mississippi child presented findings from the IMPAACT P1030 trial, which aims to learn more about early treatment of HIV-infected infants. This analysis included 18 perinatally infected infants (half girls and half boys) who started treatment with lopinavir/ritonavir-based ART either before or after 6 weeks of age and achieved at least a 2-log decrease in plasma viral load by 24 weeks or <400 copies/ml by 48 weeks. The median ages at ART initiation were just under 6 weeks for the five children in the earlier treated group and 11 weeks for the 13 children in the later treated group. Looking at both groups combined, the median pre-treatment level of HIV DNA in PBMCs was 3.16 log10 copies per million cells at baseline, falling to 2.02, 2.06 and 2.12 log10 copies at weeks 24, 28 and 96, respectively. After starting ART, viral DNA decreased faster in the earlier compared with the later treated group. Overall, HIV DNA levels at baseline were highly correlated with levels after starting treatment. The researchers also measured bits of unintegrated viral DNA known as 2-LTR circles. These were detectable in 83% of the infants at baseline, falling to 69% at week 24 and 57% at week 48, but then rising back to 83% at week 96. According to the published study abstract, 2-LTR levels after ART initiation were substantially lower among infants treated before six weeks. "HIV DNA was in excess of replication-competent genomes at all time points tested," they noted. There was evidence of "preferential clearance of transcriptionally active cells with combination ART, though unspliced RNA [was] detected through 96 weeks." These results demonstrate "rapid establishment of a large pool of HIV-1 infected cells within [the first] two months of life in perinatal infection," the researchers summarised. These findings "have implications for refining combination ART for infants, including with immunotherapeutic approaches, towards long-term remission." Turning to early treatment for adults, Jade Ghosn and fellow investigators modelled short-term and long-term declines in the cell-associated HIV DNA reservoir among participants in the French ANRS PRIMO cohort. This analysis included 327 people who started ART (mostly protease inhibitor-based regimens) during primary HIV infection (median 41 days post-infection) and maintained viral suppression for just over two years. More than 80% were men and the median age was 36 years. The earlier ART was started after infection, the faster the HIV DNA reservoir decreased during the first eight months on treatment. HIV DNA levels fell by -0.17, -0.13 and -0.07 log10 copies per 1,000,000 PBMCs per month in those who started ART at 15 days, one month and three months after infection, respectively. After eight months on treatment, HIV DNA continued to fall, but with a less steep slope and with similar decreases regardless of when ART was started. The model predicted that after five years of uninterrupted treatment, HIV DNA levels would be significantly lower for people who started ART at 15 days versus three months after infection (1.62 log10 vs 2.24 log10 copies per 1,000,000 PBMCs, respectively). This study "provides strong arguments in favour of combination ART initiation at the earliest possible time point after HIV infection, and thus in favour of early screening," the researchers concluded. Determining sustained viral remission – or a 'functional cure' – will require experimental treatment interruption, but this is a risky strategy as HIV almost always rebounds sooner or later. Researchers are therefore trying to find biomarkers to indicate which patients will rebound and when, to select those with the best chances of prolonged remission. 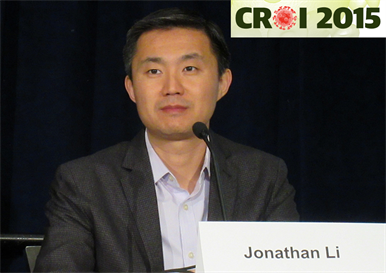 Jonathan Li from Harvard Medical School and colleagues looked at the timing of HIV rebound in relation to the size of the pre-treatment viral reservoir, including the latent reservoir of cell-associated HIV DNA and the 'active reservoir' of cell-associated unspliced HIV RNA and residual plasma viremia (>1 copy/ml). This pooled analysis included 124 participants from five ACTG treatment interruption studies (A5170, A5197, A5068, A5024 and ACTG 371). Most were men, the median age was 41 years and the median CD4 count was >800 cells/mm3. Twenty people had started ART during acute or early infection, while 104 did so during chronic infection. About half started protease inhibitor-based and half started NNRTI-based regimens (though none of the early group started NNRTIs). All achieved sustained viral suppression before discontinuing therapy. They received no immune-based therapies prior to ART interruption. Participants who started ART early had significantly lower levels of cell-associated HIV RNA prior to treatment interruption than those treated during chronic infection. However, there were no significant differences in levels of cell-associated HIV DNA or residual viremia. Levels did not differ based on type of antiretroviral regimen. Most participants experienced viral rebound by week 4, though some took longer, Li reported. Those treated earlier rebounded later, as did those treated with NNRTIs. A significantly higher proportion of people in the early treatment group compared to the chronic treatment group still had viral suppression at week 12 after stopping treatment (13% vs 3% using confirmed plasma viral load >200 copies/ml; 11% vs 4% using a single measurement >1000 copies/ml). Higher cell-associated HIV RNA levels were significantly associated with shorter time to viral rebound. The proportion with detectable residual viremia was significantly higher among participants with delayed viral rebound (47% if rebound at <4 weeks, 29% if 5-8 weeks and 8% if >8 weeks). However, there was no significant association between HIV DNA levels in cells and timing of viral rebound. A smaller active HIV reservoir "may mediate delayed viral rebound in participants treated during early infection," the researchers concluded. "Quantification of the active HIV reservoir may provide biomarkers of efficacy for therapies that aim to achieve ART-free HIV remission." This study provides "preliminary evidence that the number of copies of HIV RNA in cells and in plasma could be a maker of progress towards a cure," John Mellors of the University of Pittsburgh explained at a CROI press conference. "If we lower both of those, we might get closer to a cure." A related study by John Frater from the University of Oxford and fellow investigators with the SPARTAC trial looked at other potential markers that might predict viral rebound. SPARTAC enrolled 367 participants within six months of HIV seroconversion. They received either early ART for 12 or 48 weeks followed by treatment interruption or standard therapy according to CD4 count. In the 48-week group, 14% still had undetectable viral load 12 months later. In addition to levels of total and integrated HIV DNA and cell-associated unspliced HIV RNA, the researchers looked at CD4 cell count, CD4/CD8 ratio, plasma viral load, HIV-specific CD4 and CD8 T-cell responses (by ELISPOT), markers of T-cell activation (HLA-DR, CD38, CD25 and CD69), markers of T-cell exhaustion (PD-1, LAG-3 and TIM-3), IL-6 (an inflammation marker) and D-dimer (a coagulation marker). They found that people with greater HIV-specific CD4 and CD8 cell responses had lower HIV DNA levels, but this did not predict viral rebound. While several of the biomarkers were associated with HIV DNA level in a univariate analysis, only CD4 count, viral load, CD38 and LAG-3 on CD8 T-cells, and D-dimer remained significantly associated in a multivariate analysis. Exhaustion markers (PD-1, LAG-3 and TIM-3) on CD4 cells predicted viral rebound – but only when measured pre-treatment, not at the time of ART interruption. In fact, no other biomarker besides total HIV DNA predicted viral rebound when measured at the time of treatment interruption. In the search for biomarkers to help stratify patients treated during primary infection, "these data indicate that pre-therapy measurements may be informative and that markers of T-cell exhaustion should be included alongside HIV-1 DNA levels," the researchers suggested. "If the immune system shows signs of exhaustion as manifested by these three markers after suppression on ART, the degree of exhaustion predicts rebound," Mellors explained. "If cells say 'We can't handle this infection, we're shutting down,' those are the ones with fast rebound...This suggests blocking these receptors in HIV infection might improve outcomes." Payne HA et al. Early ART and sustained virological suppression limits HIV proviral DNA reservoir: CHER evidence. 2015 Conference on Retroviruses and Opportunistic Infections (CROI), Seattle, USA, abstract 35, 2015. Weibel SG et al. Detectable CMV in PBMC is associated with slower HIV DNA decay during suppressive ART. 2015 Conference on Retroviruses and Opportunistic Infections (CROI), Seattle, USA, abstract 375, 2015. Uprety P et al. Decay rate and HIV-1 DNA reservoir size following early infant antiretroviral therapy. 2015 Conference on Retroviruses and Opportunistic Infections (CROI), Seattle, USA, abstract 374, 2015. Ghosn J et al. The earlier cART is initiated during PHI, the more intracellular HIV-DNA decreases. 2015 Conference on Retroviruses and Opportunistic Infections (CROI), Seattle, USA, abstract 373, 2015. Etemad B et al. (Li J presenting) The size of the active HIV reservoir predicts timing of viral rebound. 2015 Conference on Retroviruses and Opportunistic Infections (CROI), Seattle, USA, abstract 110LB, 2015. Hurst J et al. (Frater J presenting) Biomarkers to predict viral rebound at antiretroviral therapy interruption in SPARTAC. 2015 Conference on Retroviruses and Opportunistic Infections (CROI), Seattle, USA, abstract 111LB, 2015.